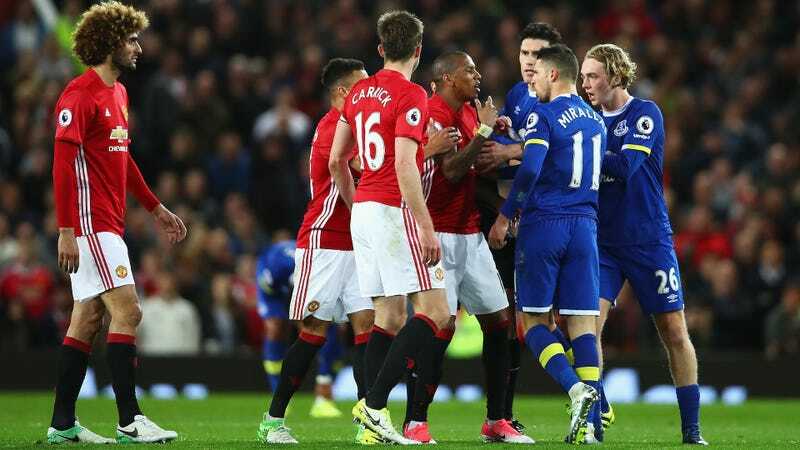 Today’s Manchester United-Everton game could’ve been a big deal to either team. If Everton won, they would’ve leapt over Arsenal and United to take the fifth spot in the table, just five points behind Man City in fourth; while they still would’ve had basically no realistic shot of finishing in the top four, they could’ve at least pretended they did without getting laughed at. A United win would’ve been a statement of intent, making clear that the Red Devils were serious competitors in a top four race that they would extend to the very last days of the season. In the end, the game finished 1-1, which doesn’t really help either of them. Everton weren’t going to get a Champions League spot before today, and still won’t now. United could’ve maybe forced themselves back into the top four race, and while the odds are against them doing so after this result, it’s not so unrealistic a proposition that they should give up now. Still, for the richest club in the world, it looks like it’s Europa League title or bust.